With gold quietly showing some price appreciation, and traditionally known as a safe haven against global political risk, gold stocks may soon be coming back into favour. Prospech is a gold and silver explorer with projects in Slovakia and is currently undergoing an IPO and ASX listing. Raisebook investors are now invited to bid for shares in Prospech. Post IPO, Prospech will own 100% of multiple known gold/silver epithermal deposits in 3 exploration licenses around the the Slovakian mining town of Banska Stiavnica. Epithermal deposits are a major source of gold, providing about 12% of the world's production. They form very close to the surface of the earth's crust. Prospech is exploring for these kinds of deposits in a region with a 5,000 year mining history, in what was historically the treasury of the Austro-Hungarian Empire. Over the last 1,000 years, the region has recorded production of 120 million ounces of silver and 2.4 million ounces of gold. The Rozalia Mine, in the middle of Prospech's Hodrusa-Hamre tenement (but not owned by Prospech), has reported annual net profits of approx. 8 million euros from the production of a mere 20,000 ounces of gold equivalent. These strong figures can be achieved by virtue of the ore grade and the competitive Slovakian cost structures - both factors that Prospech can also benefit from. Prospech's Exploration Target is 2.8 to 6.8 million ounces of gold and 81 to 290 million ounces of silver, at grades of between 3.5 - 7 g/tonne gold, and 100 - 300 g/tonne silver. Drawing on more than a millennia of mining activity and recent exploration encouragement, the company will be aggressively pursuing these targets. This company's gold and silver targets still remain in the ground due to a communist era focus on base metals - meanwhile medieval mining predominantly focused on silver only (the currency of the day). Prospech snapped up these projects as they were orphaned by a company that refocused to another development. With in country experience, Prospech was in the right place, with the right people, at the right time, to take up the projects, and is now raising funds to accelerate their exploration and prove up additional value. Let's go into a bit more detail on the projects. Prospech has secured rights to 4 exploration licenses, with an initial focus on three in particular, situated around the mining town of Banksa-Stiavnica. All known gold-silver outcropping veins in the Banska Stiavnica caldera are now controlled by the company. 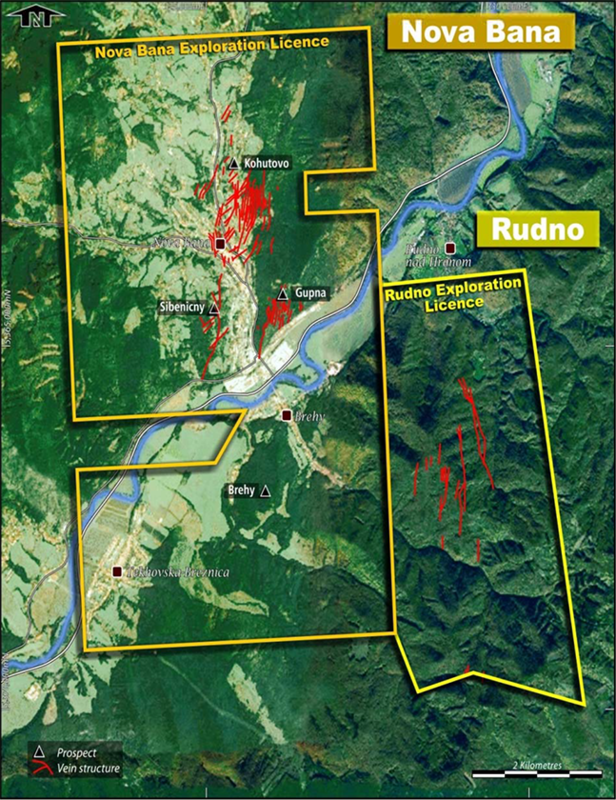 This exploration license surrounds the Rozalia Gold Mine, which historically produced 800,000 tonnes of gold with an average grade of 8 g/tonne. Prospech is focused on exploring a number of targets across identified vein structures in the vicinity. One particular large vein structure, Schopfer, sits next to the Rozalia Mine processing facility, and short underground drill holes conducted by Prospech returned very encouraging results - up to 7.3 g/tonne gold and 515 g/tonne silver. Schopfer is drill test ready right now. Both the Ignac-Rabenstein and Banky prospects have been interpreted as probably Rozalia Mine equivalents. Encouragingly, Prospech has picked up 29 rock chip samples at Ignac averaging 7.8 g/tonne and 33 g/tonne to date. Another target, Klokoc has seen drilling already, confirming historic drilling, and 500m of open strike is now ready to be RC drilled. Prospech are focusing on an epithermal gold system here with veining known over an area of 3.8 x 1.6 km. Bonanza gold grades were recorded in medieval times, however no modern mining has taken place - this is essentially a virgin field. Prospech drilling has returned good near surface results & visible gold at depth at one prospect Gupna, meanwhile the company has confirmed mineralisaton continuity at the junction of geologic structures at another prospect Kohutovo. Jasenie is open ground pegged & owned 100% by Prospech. It's an 18km long x 400m-1000m wide anomaly on the south slopes of the Nizke Tatry mountains. High gold assays from rock chips have shown grades of between 72.0 g/tonne and 77.5 g/tonne. The average gold grade from 33 rock chip samples in the valley is 9.07 g/tonne. The purpose of this IPO fund raising is to enable Prospech to accelerate its exploration activities with an objective of the development and exploitation of one or more of the numerous prospects in the Company’s geologically rich tenement areas. 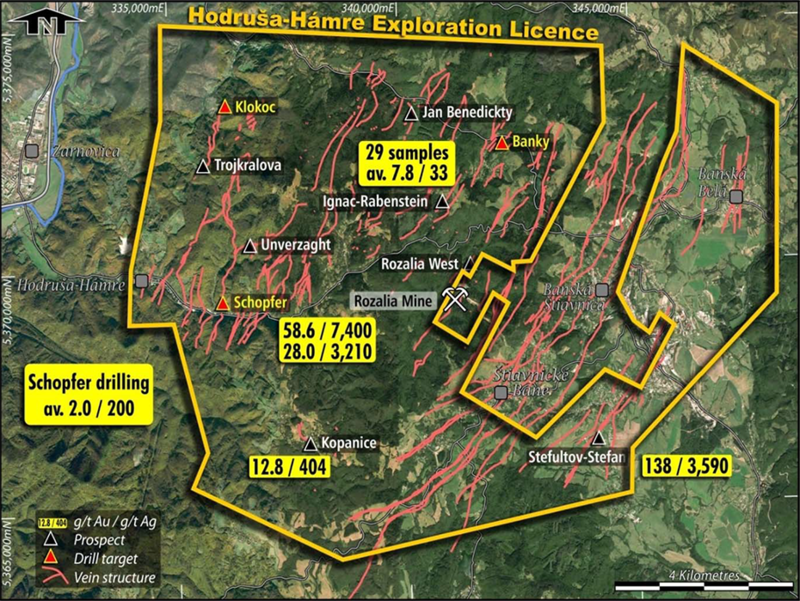 In particular, the company is setting out to define a resource at Hodrusa-Hamre, near the Rozalia Mine. This will focus on the Ignac-Rabenstein and Banky prospects as they are the most advanced. Permitting is already underway for Ignac, and Banky's historical drilling including 4m @ 7.99 g/t gold and 331 g/tonne silver show promise. The company will also be further defining additional resources for the Schopfer & Klokoc targets, and Nova Bana. Aside from resource definition, Prospech have a ranked exploration target list to hunt down across the Hodrusa-Hamre license - numerous shallow targets, with high grade samples, that are near processing facilities. Adjacent to Austria, Slovakia is a member country of the European Union and the Eurozone. With modern, western-style legislation, a regimented legal system, low wages, low tax rates and a well-educated labour force, the country is an attractive jurisdiction for foreign investment. Prospech’s positive experience of doing business in Slovakia since 2014 has encouraged the Company to capitalise on having a presence of skilled staff in the country, by applying for other exploration licences at minimal cost. This includes expanding the licence areas of its two main projects, Hodrusa Hamre and Nova Bana. The Company now has granted exploration licences which cover an area of approximately 185km². Under this IPO Prospectus, the company is seeking to raise $5 million at an issue price of $0.20 (25 million shares) with an attaching 1 for 2 Loyalty Option ($0.25 strike price and 2 year term). There is a provision to accept a further $2.5 million in oversubscriptions. Following close, the company will have an Enterprise Value of $12.3 million, equating to $1.09 - $3.04 per Exploration Target Gold Equivalent Ounce. With strong newsflow ahead following the IPO, we are expecting strong demand.